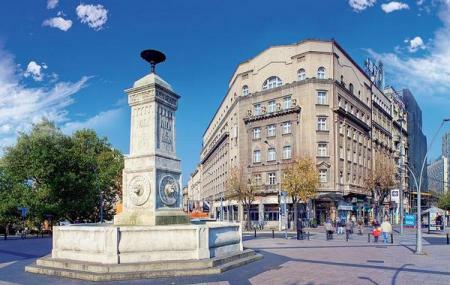 Find hotel near Terazije Square And Fount .. The squares name (which means ‘Scales’) has a very interesting origin. An ancient Roman aqueduct that distributed water to the rest of the city was maintained by several water-towers (su terazisi) that regulated water pressure. The Romantic style fountain in the centre of the square was built on the orders of Prince Milos. It’s 6.35 metres tall. The area around the fountain is a popular meeting place for locals; in other words, the people watching here is great. Apparently the locals safely drink from the fountain, but you’re advised not to – you don’t have the same immunity to the local water supply as they might have. There are a number of striking buildings around the square that add to it’s charm. The nearby Terazijska Terasa or Terazije Terrace is a park worth checking out; it climbs up a ridge from where the view of the city is lovely. Trivia: The square is also known as the Hotel Triangle – the city’s three oldest hotels are here:Moskva, Balkan and Kasina. How popular is Terazije Square And Fountain? People normally club together The National Assembly and Knez Mihailova while planning their visit to Terazije Square And Fountain.